Servers that Literally Never Fail! NEC Fault Tolerant (FT) servers provide an innovative solution to address planned and unplanned downtime for your most important applications. 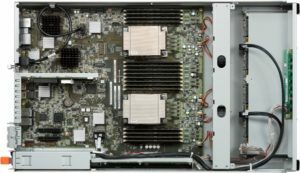 The Express5800/R320e servers deliver continuous availability for 99.999% system uptime (5 minutes of downtime per year) through its fully redundant modular hardware featuring 12-Core Intel Xeon processors that support lockstep operation. Do you want your Digital Transformation Applications to go down? We don’t think so! NEC’s FT Servers are ideal and customizable for Web Server, Mail Servers, Storage and Security Appliances, Network Infrastructure, Enterprise Software, Video Processing, Big Data, Hyperconverged Appliances, Internet of Things (IoT), In-Memory Analytics, Machine Learning (ML), Artificial Intelligence (AI), Smart City and Data Center Virtualization & Private Cloud or other High Availability Mission Critical Infrastructure Applications. Full manageability with integrated Express-scope engine 3. Support for high ambient temperature operation up to 40°C (104°F). Note : FT Control Software is required depending on the host OS (Windows or VMware), that price is not included in server price. When ordering, please select the FT Control Software below based on your operating system. We accept all major credit cards e.g. MasterCard, Visa, American Express, Discover etc. Please review our Terms and Conditions and Return, Refund and Repair policy prior to purchase. We are also pleased to partner with NEC Financial Services which has been in business since 1986, providing flexible leasing and financing programs that will help you with an affordable monthly payment option. Please contact us for more information. You must select FT Control Software when ordering the FT server. Below are the options; please select based on your operating system. NEC has pioneered high availability systems for more than a decade with the GeminiEngine™ a chipset specially engineered for transparent failover and system integrity, supports lockstep processing. One module continues to process without interruption or loss of data should a potential fault in the other module occur. Hot-swappable modules automatically synchronize and resume normal operations once the issue is resolved ensuring availability of mission-critical applications and environments. The high availability and continuous processing capabilities of NEC’s Express5800 Fault Tolerant (FT) servers make it a dependable platform for mission critical applications. Modular hardware redundancy provides up to 99.999% uptime for affordable high availability in business critical environments. he hardware components of NEC’s Express5800 fault tolerant servers are replicated and modularized for full hardware redundancy. The NEC FT servers can deliver continuous availability for VMware and Hyper-V by using internal storage and standard management software. 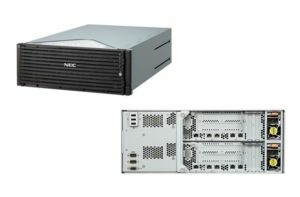 Advantages of virtualization with the NEC FT server include proven scalable vCPU performance, integrated high availability storage for CapEX savings, and simplified virtualization deployment for CapEX and OpEx savings. 51 Kg / 112.44 lbs. Not supported for VMware ESXi. Virtualization (KVM/LXC) is not supported.